The AnySharp Plus knife sharpener will sharpen virtually any knife, whether it has a hard anodized or serrated blade. A sharp knife not only makes slicing, dicing and chopping easier, but it is also safer as the knife is less likely to slip while using it. 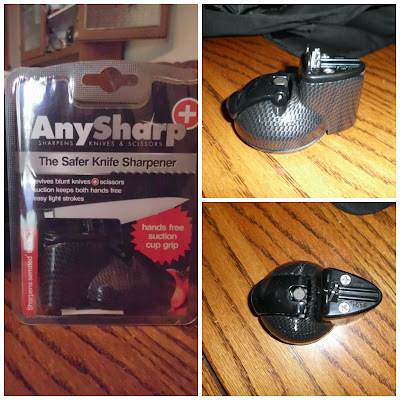 The AnySharp Pro uses tungsten carbide sharpening technology and is quick and easy to use. 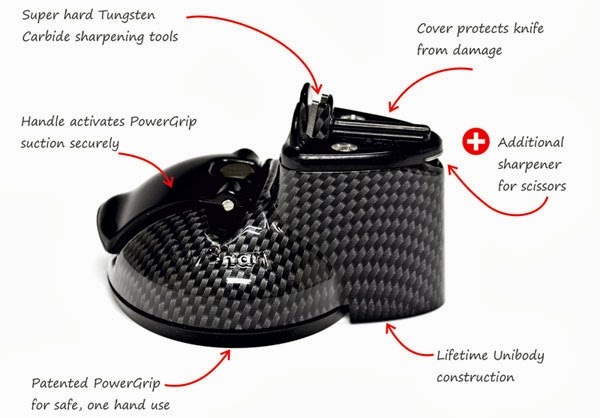 It is the world’s only knife sharpener with a patented PowerGrip suction cup which attaches securely to any smooth surface, eliminating slipping and jamming. Once attached, knives can be sharpened single handed, keeping both hands away from danger. The AnySharp’s top also has a useful scissor blade sharpener and has a long-lasting polymer guiding top that is softer than metal, and therefore won't damage the metal edge, making it safe for the knives too. What’s more, it’s small enough to store safely in a kitchen drawer. Boasting a 10 year guarantee, AnySharp Plus in an eco-friendly product available in grey or carbon fiber for purchase for just MSRP $28 direct from www.AnySharp.com. We sharpen a lot of knives around here seasonally. I don't typically sharpen them, I just get lazy and work with a dull knife. I know maybe it isn't lazy, just too busy to locate the flat stone we use for sharpening, or the long narrow rod. Both that scare me to consider using to sharpen a knife anyhow! We do process much of our own meat and my hubby and boys sharpen knives continually through the process. I was so excited to share with them the Any Sharp knife sharpener. With the Any Sharp it is super easy to sharpen your knives and scissors. You simply run the blade through 3 or 4 times, lightly and you are done. This sharpener will pay for itself easily in keeping your drawer supplied with sharp knives, making it unnecessary to purchase new knives. Be sure to check out their products online and visit them on these social media sites.